Hybrid car fuel economy | How many miles per gallon can you expect? Myth Busting: Is There Really A Hybrid Car With A 6,000 MPG Rating? In 2009, the automobile industry was desperate for some good news. So when GM announced that their new hybrid car, the Chevy Volt, would get an unbelievable 230 MPG rating and feature advanced hybrid car batteries, the media ran with the story like a dog with a bone. Of course, like many such stories, the 230 MPG rating really was unbelievable, literally. It quickly became clear that GM was blowing smoke up our collective exhaust pipes. So you should be skeptical when you read headlines like, “Students Test 6,000-Plus MPG Eco-Marathon Cars At Le Mans.” But for once, there’s nothing hyperbolic about this headline, although you won’t exactly see cars at your local dealer with that kind of gas mileage. Every year, the Eco-marathon contest brings together budding high school and collegiate engineers to compete to push the boundaries of hybrid car fuel economy with “hyper-efficient vehicles.” The event also serves as a showcase for automakers and oil companies competing to improve hybrid car batteries. While the test models feature incredible hybrid cars fuel economy ratings, they aren’t actually meant for consumer use. The 30th Eco-marathon wrapped up in Rotterdam this May, and the standout prototype could travel from Rotterdam to Moscow with just one liter of fuel. And this June, students in France tested another Eco-marathon prototype ahead of the famous French race, 24 Hours of Le Mans. At the French event, the vehicle reportedly reached a MPG of more than 10,000 using advanced hybrid car batteries and new technology. For U.S. consumers looking to drive hybrid cars, cars like the Honda Civic Hybrid, Toyota Prius, and Honda Insight have hybrid car batteries that make them about 20-35% more fuel efficient than traditional gas guzzlers. The Eco-marathon lets auto makers, oil companies, and other manufacturers investing in better hybrid cars fuel economy to show off their new tech for the growing market. 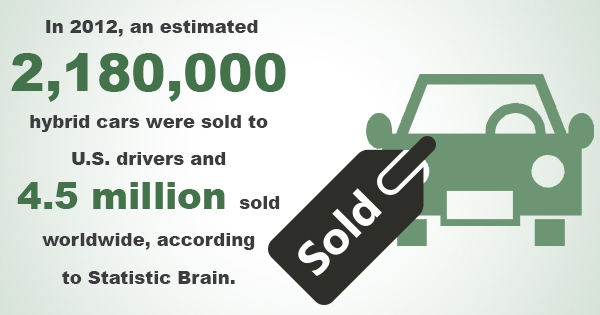 In 2012, an estimated 2,180,000 hybrid cars were sold to U.S. drivers and 4.5 million sold worldwide, according to Statistic Brain. If you’re looking for a green car with the best hybrid fuel economy, then the 2000 Honda Insight ranks as the most fuel efficient vehicle on the road. The United States Environmental Protection Agency says the Honda Insight mileage rating reaches a combined city/highway rating of 53 MPG (61 MPG on the highway).